In terms of 'codifying' what we've learned - and are continuing to learn - about facilitation, the topic of 'front of room facilitation' is probably one of the more challenging, especially when it comes to education for relative beginners to the field of design and facilitation. One of the questions that Jules and I are often asked is generally along the lines of: "How do you manage a conversation or a group, especially when things don't go to plan?". We've thought long and hard about how to best respond to this in a way that neatly conveys lots of meaning in an efficient and easy-to-understand way. And to be honest we still can't beat the power of metaphor and analogy. So here it is. Front-of-room facilitation is a lot like being a 'guide', as in one who is guiding a group through natural, and often treacherous, terrain. A guide will often have a compass: For the facilitator, the equivalent of the compass is the purpose of your session, in particular the outcomes of your session. When you're lost, go back to this purpose-compass and it will help you get your bearings and find a new path. 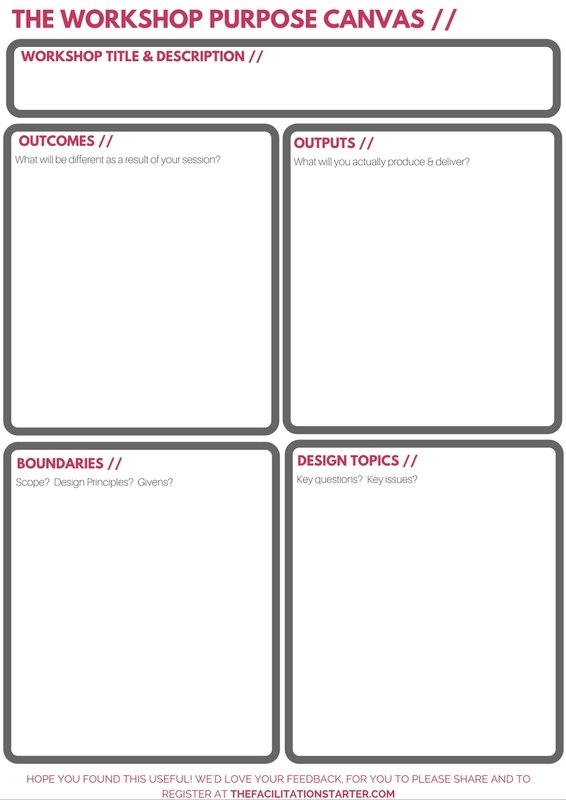 A guide will often have a map: For the facilitator, your map is your session design or agenda. Be aware though that your 'map is not the terrain', but rather a representation of this terrain. What it won't show is the massive log that's fallen over the trail or path that's being washed out by flooding. Given these unexpected encounters, the facilitator must adapt to this new situation. A guide is constantly looking and listening for signals from the environment and the group: In the natural setting, the guide will look for clues that lead to food, water, rescue or shelter as well as signs of possible danger. She will also look for signs of fatigue or conflict from the group. Similarly, the group facilitator is constantly scanning for and tuning into verbal and non-verbal signals from the group and from the workshop environment. Signals suggest possible courses of action for the guide: the guide should always have options, but may not always have 'the' answer or decision-making power. For example, she might notice signals of inclement weather and a tired group member and make the recommendation that the group make camp earlier then they otherwise might have. Similarly, the facilitator will process the multiple signals that she has sensed from the group and her environment to develop a mental model of what's happening and what choices the group has to make. Does the group need to open, explore or close? Do they need to zoom in or zoom out? Are they getting stuck in the detail or do they perhaps have their heads in the clouds and avoiding the detail? What is the right mode of work? Individual? Small group? Whole group? The guide leverages the natural environment for the group's advantage: The guide is extremely resourceful and is constantly scanning for what she can leverage and harvest from her natural environment to the benefit of her group. It might be water, food or firewood. It might be a piece of glass which she could use to make fire or use as a reflector to signal rescuers. Similarly, the facilitator must harvest and capture the most useful elements of participant's work and conversation to then reflect back to them in a way that will support the group's purpose. This could take the form of a really novel insight or idea or a powerful story that would help the group move forward. The guide is at the service of the group: This is perhaps the most important way that the facilitator is like the guide. There have been countless stories of selfless sherpas who take enormous, and often deadly, risks to help climbers reach the peak of Everest. No one is expecting the group facilitator to risk her life for the sake of the group. Rather the key point to emphasise here is that as a facilitator, it's not about you, it's about the group and how you are a steward to helping them achieve their purpose and their potential. So the next time you're at the front of the room, get yourself into the mindset of being the 'guide' for the group and then reflect on what impact this had for you and the group. 'Session design' or 'process design' is one of the 5 key jobs of the facilitator. It also happens to be one of my favourite things to do as a facilitator. I also get asked a lot of questions about how to do it and see a lot of examples of it not being done well (IMHO).